Does the title mean anything to you? I know the first word is tofu, but that's about it. A couple months ago, I found a brand new starting site called Bap Story. I love this site, and it has this recipe for soy seasoned tofu. It has all the Korean foods that I love and wish my mom knew how to make, if my mom were Korean. But alas, she is Taiwanese. My mom, like most other Asian moms, be crazy. Hopefully this doesn't offend anyone, but she IS. Most people won't agree with me - everyone is always saying "your mom is so funny, your mom is so nice, your mom is so cute" etc etc etc. She may be those things now, but in high school we fought like cats and dogs. Like screaming at each other at the tops of our lungs style fighting. Nothing brought us closer together as me moving out of the house. She's mellowed out a lot more now that my brother and I aren't in high school anymore ... but as he says "When mom is nice, she's pretty nice. But when she's not, she's f**king crazy." I hope my future-maybe-kids don't say that about me, but let's face it - they probably will. I saw evidence of this last night. Super tired from work, I felt like cooking (which of course, made me more tired - stupid me) and made steak, bok choy in ginger sauce and the soy seasoned tofu. Boyfriend is not a fan of tofu (he's Italian - is that an excuse?) but really enjoyed the green onion sauce on top - so much that he wasn't even eating the tofu, but was picking bits of green onion off the top. With his fingers. I snapped "Stop picking at it with your hands!" and then froze in horror. I actually love picking at food with my hands. This wasn't me talking - this was my mom! I'm doomed. Mix all soy seasoning ingredients together and set aside. Wrap tofu in paper towels for 10 min, to blot excess moisture. Mix together cornstarch and flour. Cut tofu block in half lengthwise, and then into 1/2 inch pieces. Dredge in cornstarch/flour mixture, shaking off excess. Heat oil in flat bottomed pan over medium high heat. 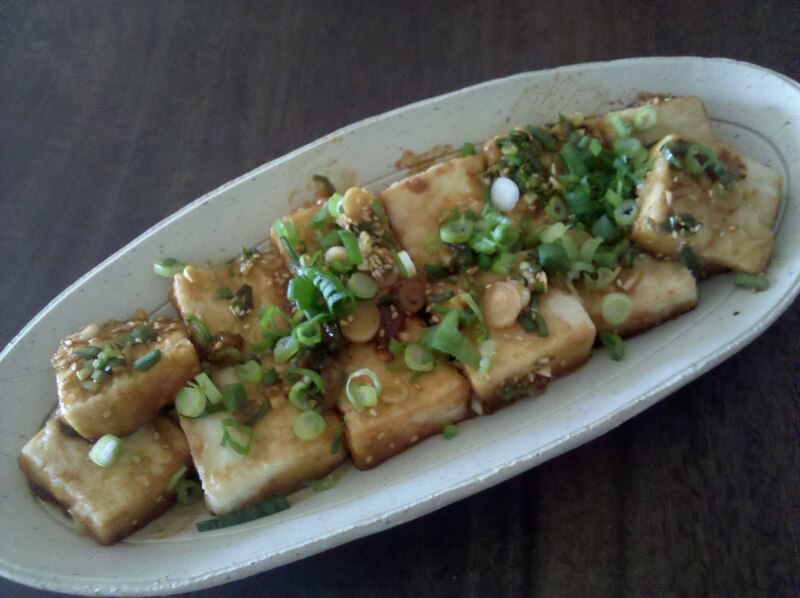 When oil is hot, carefully place tofu pieces and allow to brown on one side (3-5 min). Flip over and allow to brown on the other side. Pour in seasoning (it will sizzle) and allow it to bubble - it will be absorbed by the tofu. When the sauce is almost all gone (about 3-4 min), take the pan off the heat. Serve garnished with additional green onions and sesame seeds. Last night, boyfriend was working late. Or he said he was working late, but showed up at home 1.5 hours before he said he'd even be off work. Was he trying to see what I was up to? All he got was me finishing up the season of Boardwalk Empire (such a great show) and reading through all the archives of WeezerMonkey, which I am thuroughly enjoying. I have a sicknes in that whenever I start reading someone's blog, I start FROM THE BEGINNING. My Type-A personality-self likes things in chronological order. Since I met her at my first foodblogging event, Monkey (as she refers to herself) has been amazing to talk to on Twitter and is maybe a potential lunch buddy (once I make it to present day times in the archives and find out if she's still working close to where I do). I remembered on my way home from work that I had some broccoli lingering in the fridge, so I stopped by the market to get a pound of shrimp and do a quick oven-bake, from reading Luisa's site (The Wednesday Chef). Quick, delicious, and low in calories (if you don't eat it with rice, which is highly recommended). Since I made it the very first time and had my mind blown with the combnation of ingredients, I make this dish once every couple of months. Preheat oven to 425F. In a large bowl, toss broccoli with 2 Tbsp oil, coriander, cumin, 1 tsp salt, 1/2 teaspoon pepper and chili powder. In a separate bowl, combine shrimp, remaining 2 Tbsp oil, lemon zest, remaining 1/2 tsp salt and remaining 1/2 tsp pepper. Spread broccoli in a single layer on a baking sheet and roast for 10 minutes. 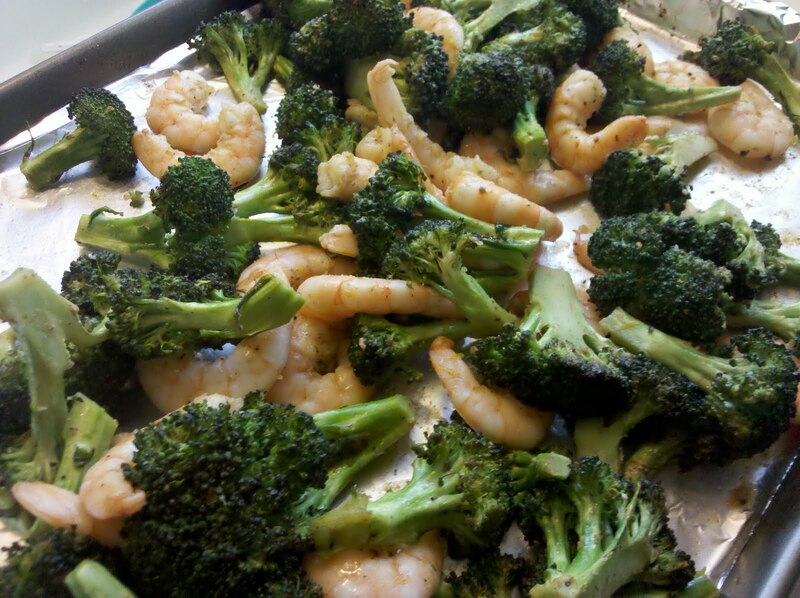 Add shrimp to baking sheet and toss with broccoli. Roast, tossing once halfway through, until shrimp are just opaque and broccoli is tender, about 10 minutes more. Serve with lemon wedges, or squeeze lemon juice all over shrimp and broccoli (and toss again) just before serving. It shames me to say that I've never roasted a chicken. Ever! I don't know why either - every writer out there says its the easiest thing. Simply season, truss and bake. Bam! An entire roast chicken, which could probably feed me for a week. Of course, for my first, I had to start out with the best. The best being the best chef of them all, Thomas Keller. Now, you may have different opinions on whether he is THE best chef, but there is no denying that the man is something of a genius. Though I haven't had the opportunity yet to go to The French Laundry (someday ... someday), I have gone to the Bouchon locations both in Beverly Hills and Las Vegas, and the food was simply divine. Boyfriend claims the steak frites is the best steak he has ever eaten, and he likes his meat (har har). I marvelled even at how well selected and beautiful the market lettuces were in the salads, how the colors shone like gems and were perfectly dressed ... but I digress. This is all about Thomas Keller's Roast Chicken with Root Vegetables. 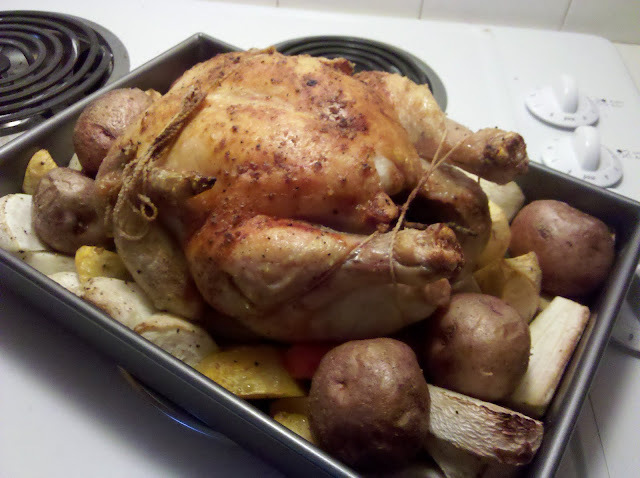 His Ad Hoc roast chicken, to be exact. Mr. Keller has a very exact and specific recipe. This, dear readers, is a thing of beauty. Granted, I think I need a bigger roasting pan because not all my veggies were 100% softened and carmelized the way they were supposed to. But I think it is also because I didn't follow the exact directions to find "golf ball sized red potatoes." I tried, but it's been a long time since I've mini-golfed damnit, and I think I misjudged how small a golf ball actually is. Don't make my mistake! Hopefully your veggies will come out softer than mine. When I first poked my chef's knife to carve the chicken, the skin actually crunched. Crunched. It was one of the most beautiul sounds in the world. Of course, after eating all the juicy, flavorful chicken we could cram into ourselves, dessert had to be somewhat healthy. 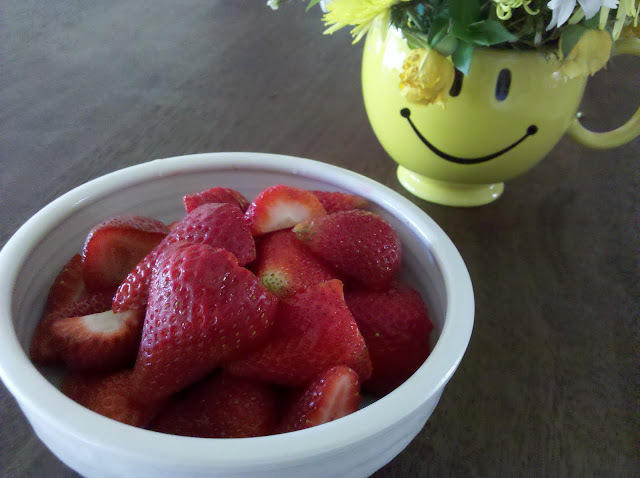 Strawberries are popping up all over, and these were courtesy of my mom. Remove the chicken from the refrigerator and let stand at room temperature for 1 1/2 to 2 hours, or until it comes to room temperature. Preheat the oven to 475F. Remove the neck and innards if they are still in the cavity of the chicken. Using a paring knife, cut out the wishbone from the chicken. Generously season the cavity of the chicken with kosher salt and freshly ground pepper (I mixed up a combination in a small bowl first, then scooped out as much as I needed), add 3 of the garlic cloves and 5 sprigs of thyme, and massage the inside of the bird to infuse it with the flavors.Truss the chicken. Watch as many Google videos on this as necessary. In the end, stare down the chicken and give up - have boyfriend do it, which he does promptly after watching one video. Cut off the dark green leaves from the top of the leeks. Trim off and discard the darkened outer layers. Trim the root ends, cutting around them on a 45-degree angle. Slit the leeks lengthwise almost in half, starting 1/2 inch above the root ends. Rinse the leeks well under warm water, trying to get all the dirt between each layer. Cut off both ends of the rutabagas. Stand the rutabagas on end and cut away the skin, working from top to bottom and removing any tough outer layers (or using a peller, like I did). Cut into 3/4-inch wedges. Repeat with the turnips, cutting the wedges to match the size of the rutabagas. Combine all the vegetables and remaining garlic cloves and thyme sprig in a large bowl. Toss with 1/4 cup of the oil and season with kosher salt and pepper. Spread the vegetables in a large cast-iron skillet or a roasting pan. Rub the remaining oil over the chicken. Season generously with kosher salt and pepper. I used the remaining salt and pepper combination left over from seasoning the cavity of the chicken. Make a nest in the center of the vegetables and nestle the chicken in it. Cut the butter into 4 or 5 pieces and place over the chicken breast. Put the chicken in the oven and roast for 25 minutes. Reduce the heat to 400F and roast for an additional 45 minutes, or until the temperature registers 160F in the meatiest portions of the bird (the thighs and under the breast where the thigh meets the breast) and the juices run clear. 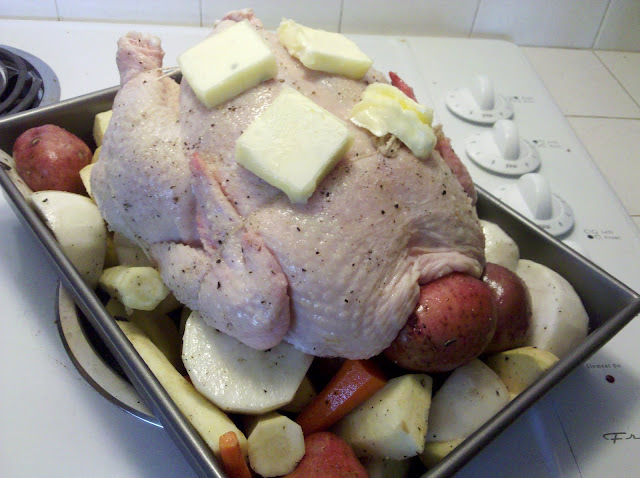 If necessary, return the bird to the oven for more roasting; check it every 5 minutes. Transfer the chicken to a carving board and let rest for 20 minutes. Just before serving, set the pan of vegetables over medium heat and reheat the vegetables, turning them and glaazing them with the pan juices. Cut the chicken into serving pieces, arrange over the vegetables and serve. * I also added three parnsips, which I had languishing in the fridge, as I had determined them to be a "root vegetable". * I forgot the onion, which I am sad about because I think it would have perfumed the veggies even more. * Yellow happy face cup was brought home full of flowers by boyfriend. Yay! Sometimes, for whatever the reason, I just feel like cooking. It can be because I had a long (or short) day at work, it's rainy outside (or sunny), I just received some bad news (or an unexpected surprise). See, it can be absolutely anything! One such day hit me a couple weeks ago, right before I went on my trip to Asia. Needless to say, I cooked like a madwoman. He is so lucky, right? I know, I agree.﻿﻿ While the steak was nice and medium-rare and the huge (the size of my palm) succulent scallops seared-but-a-bit-burnt, the star of the show is definitely the one in the top left corner. Bacon Corn with Miso Butter. Oh my god. One of the best things I have ever made. The recipe comes from the Momofuku cookbook, which is a definite must-buy. The writing is hilarous and moves along in the way that you wouldn't even know you were reading a cookbook, if it weren't for all the mouth-watering photos. David Chang wrote that they only served the dish for one summer because when they did, Momofuku was like "a corn restaurant that served noodles on the side." I wish it were possible for me to taste what the master himself made, though it is highly unlikely. Make that dish!! If you won't buy the cookbook and want the recipe, let me know in the comments and I'll get it to you. Because everyone needs to eat Bacon Corn. 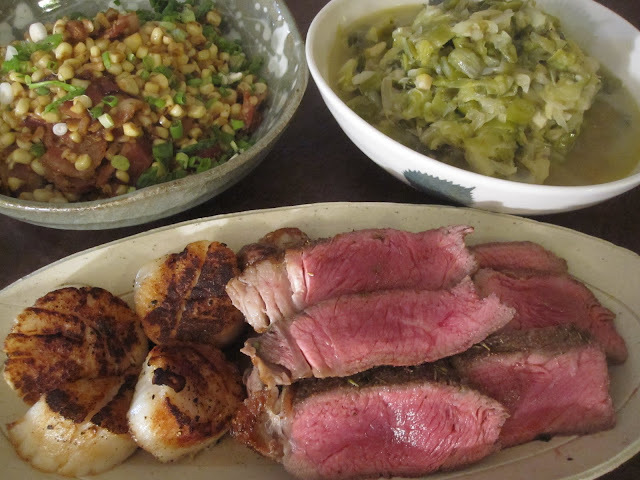 I was underwhelmed by the other side, Melted Cabbage and Green Garlic. For some reason, the dish tasted just a bit slimy to me. However it may be right up your alley. I've never cooked with green garlic before and indeed the dish was very garlic-y and velvety smooth, but just didn't appeal to me. If it sounds like your thing, go on and give it a try. 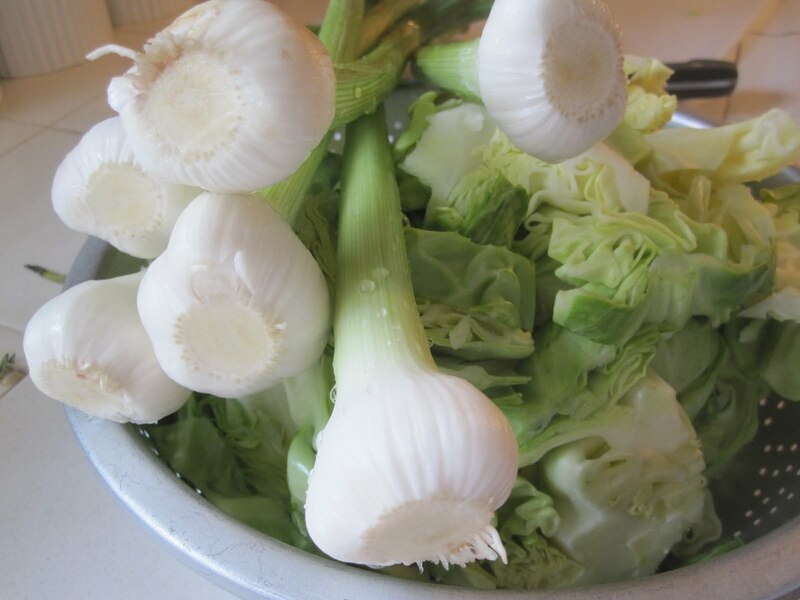 Bring large pot of salted water to a boil, add the cabbage, and boil for 3 minutes. Drain well, chop finely, and set aside. Trim the root end and tops off the garlic so that you hae the white part and about 4 inches of green. Discard any yellow/odd-looking leaves, and then chop garlic. In a deep, wide pan, melt the butter over medium-low heat. Add the onion, green garlic, and a little salt. Cook gently, stirring occasionally, until translucent and soft (5-7 minutes). Cover, reduce heat to low, and cook slowly until the vegetables are reduced and very creamy, about 1 hour. Stir occasionally and add the stock after the 30 minute mark. If there is a lot of liquid the next time you check the pan, leave the lid off for awhile. If the mixture is dry/sticky, add a bit more stock and stir. Season to taste with salt and pepper.